NASA launched five suborbital rockets in the early morning hours of March 27, 2012 to study the planet's upper level jet stream for the ATREX (Anomalous Transport Rocket Experiment) mission. Each of the rockets released a chemical tracer that created milky, white clouds at the edge of space that were reported to be seen from as far south as Wilmington, N.C., west to Charlestown, W. Va., and north to Buffalo, N.Y.
NASA launched a barrage of small rockets early Tuesday (March 27), with five rockets blasting off within five minutes to create glowing clouds at the edge of space that wowed skywatchers all along the U.S. East Coast. The rocket launches capped nearly a week of vexing delays for NASA's Anomalous Transport Rocket Experiment, or ATREX. The five suborbital rockets launched to the edge of space more than 60 miles (97 kilometers) above Earth and released a chemical tracer known as trimethyl aluminum. Each of the rockets released a chemical tracer that created milky, white clouds at the edge of space," NASA officials said in a statement. "The launches and clouds were reported to be seen from as far south as Wilmington, N.C.; west to Charlestown, W. Va.; and north to Buffalo, N.Y."
Skywatcher and photographer Jack Fusco snapped this photo of the glowing clouds created by NASA's five-rocket ATREX launch from Seaside Park, N.J. (north of the rockets' Virginia launch site) on March 27, 2012. The launches followed repeated delays due to bad weather, a wayward boat in the launch range and a technical glitch, which forced the mission to postpone its initial March 14 liftoff target. But braving the delays for a chance to glimpse glowing clouds near space was worth it, skywatchers said. Astrophotographer Jeff Berkes caught spectacular views of the ATREX clouds from outside Philadelphia, Pa. In his images, the clouds look like a huge, iridescent creature with wings spread across the predawn sky. "It was a great show," Berkes told SPACE.com in an email. The $4 million ATREX mission is aimed at better understanding the high-altitude jet stream, which streaks along at altitudes of 60 to 65 miles (97 to 105 km) — much higher up than the jet stream commonly referred to in weather forecasts, which is found just 6 miles (10 km) or so above Earth. Theory suggests that this high-altitude jet stream should blow at only about 50 mph (80 kph), but in truth the average speed is closer to 200 mph and occasionally hits 300 mph, researchers have said. 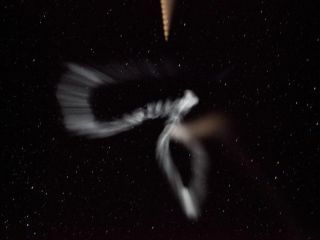 The chemical release of five ATREX sounding rockets created a series of glowing clouds in the high-altitude jet stream at the edge of space on March 27, 2012. Here is NASA's view from the Wallops Flight Facility at Wallops Island, Va.
To conduct the ATREX experiment, NASA used small sounding rockets capable of reaching suborbital heights, but not powerful enough to completely enter orbit and circle the Earth. Observing stations in Tuckerton, N.J., Duck, N.C., and the Wallops Island launch site were positioned to record the results. The outcome, skywatchers said, was amazing. In Seaside Park, N.J., skywatcher and photographer Jack Fusco snapped an eye-catching view of the eerie clouds from a dark beach, with the Milky Way serving as a backdrop. "It was well worth a few sleepless nights and ending up in the freezing, windy conditions to catch this view," Fusco told SPACE.com in an email. If you snapped an amazing photo of the ATREX glowing clouds, or any other skywatching target, and would like to share it for a possible story or image gallery, please contact SPACE.com managing editor Tariq Malik at tmalik@space.com.